I'm really craving fall foods. Well, not necessarily fall foods per say, more just rich, hearty, warm foods - like a fantastic baked pasta. I typically make lasagna or manicotti/cannelloni when I want a baked pasta but this time I decided to vary it up a smidge. We were recently at an Italian restaurant and I almost ordered the Baked Ravioli because it looked so good, but we were really just there for the bar side of the restaurant so I got a Roast Beef sandwich instead. Ever since though I've been wanting Baked Ravioli. What better way to curb that craving than to make it myself?! - Heat oil in a large saucepan over medium heat. - Add onion and garlic, and season with salt and pepper; cook, stirring occasionally, until softened, about 5 minutes. - Add thyme and tomatoes. Bring to a boil, reduce heat, and simmer, breaking up tomatoes with spoon, until sauce is thickened and reduced to about 5 1/2 cups, 20 to 25 minutes. - Meanwhile, cook ravioli in a large pot of boiling salted water just until they float to the top (pasta will continue to cook in oven). - Drain pasta; return to pot. - Toss sauce with pasta. 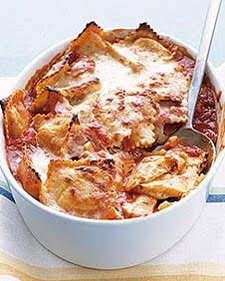 - Pour pasta into a large gratin dish or 9-by-13-inch baking dish, and sprinkle with cheeses. - Bake until golden, 20 to 25 minutes. Cool slightly before serving. I LOVE baked pasta dishes like this - especially with all that cheese!